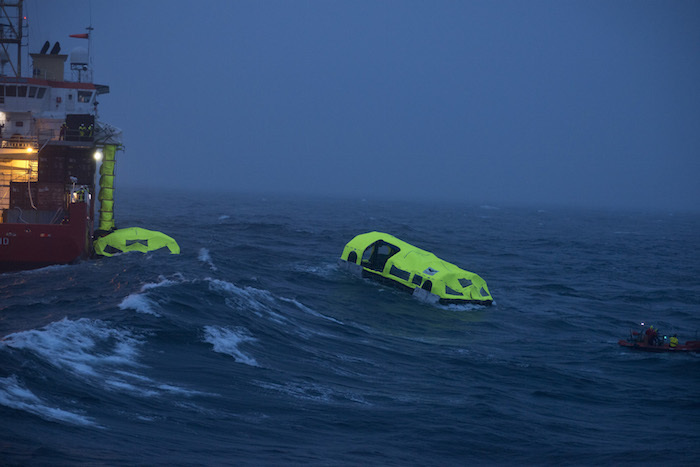 Developed and extensively tested by leading maritime safety equipment and servicing provider VIKING Life-Saving Equipment over the past 10 years, the new evacuation system unites the advantages of modern lifeboats – such as self-propelled manoeuvrability – with the flexibility, comfort and smaller footprint of today’s liferafts combined with marine evacuation systems. “The LifeCraft™ exhibited superior manoeuvrability, sailing away from the ship much faster than required. We achieved this with the wind at our front as well as our backs, which makes it an even more impressive feat,” says Niels Fraende. The tests demonstrated, too, that the system’s flexible chute arrangement could easily cope with the ship’s list and trim, providing exceptional stability despite the highly dynamic sea state. With its four electric motors, one positioned at each corner, the fully loaded LifeCraft™ was swiftly manoeuvred to a safe position within minutes of disengagement from its position along the ship’s side. Crucially, the four inflatable survival crafts are powered by electric motors instead of diesel-driven units. These not only enable excellent manoeuvrability for reaching a safe position or for rescuing passengers or ship personnel in the water, but are quieter in operation and more reliable, requiring far less maintenance. They also pose less of a fire risk and reduce evacuees’ exposure to harmful fumes. Inside, there’s strong focus on comfort, with triple the air space of existing lifeboat solutions, for example, and a novel natural ventilation system.